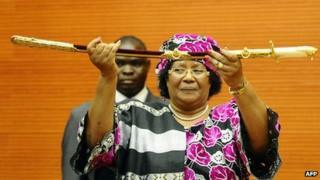 Joyce Banda, who has made history becoming Malawi's first female president and only the second woman to lead a country in Africa, has a track record of fighting for women's rights. She took power over the weekend following the death of 78-year-old President Bingu wa Mutharika, who died in office after heading up the southern Africa country since 2004. Mr Mutharika's decision to appoint her as his running mate for the 2009 elections surprised many in Malawi's mainly conservative, male-dominated society - which had never before had a female vice-president. She will never be president, how can a mandasi [fritter] seller be president? Equally surprising was her decision to publicly stand up to her boss - by refusing to endorse his plans for his brother, Foreign Affairs Minister Peter Mutharika, to succeed him as president in 2014 when he was due to retire. She was promptly thrown out of the ruling Democratic Progressive Party - and subjected to daily doses of derision at public rallies and on Malawi's state airwaves. A senior ruling party official openly said Malawi was "not ready for a female president", while First Lady Callista Mutharika said Mrs Banda was fooling herself that she was a serious politician - saying she was a mere market woman selling fritters. "She will never be president, how can a mandasi [fritter] seller be president?" Mrs Mutharika said. Mrs Banda took all this in her stride, saying she was glad to be identified with market women since more than 80% of Malawian women belong to that category: "Yes, she's right, I'm indeed a mandasi seller and I'm proud of it because the majority of women in Malawi are like us, mandasi sellers." She also resisted calls for her to resign as the country's vice-president - she was elected not appointed so she could not be fired by Mr Mutharika - and instead set up her own People's Party. Born in 1950 in the village of Malemia near the southern town of Zomba, Joyce Hilda Ntila was the eldest in a family of five children. Her father was the leader of Malawi's police brass band and her youngest sister, Anjimile, ran pop star Madonna's charity Raising Malawi until it closed in December. She left her first husband in 1981, taking her three children with her, because he was abusive. "Most African women are taught to endure abusive marriages. They say endurance means a good wife but most women endure abusive relationship because they are not empowered economically, they depend on their husbands," she told the BBC about her decision. Eight years later, Mrs Banda founded the National Association of Business Women, a group that lends start-up cash to small-scale traders - making her popular among Malawi's many rural poor. That work also earned her international recognition - in 1997, she was awarded, along with former Mozambican President Joachim Chissano, the US-based Hunger Project's Africa Prize for Leadership for the Sustainable End of Hunger. She also set up the Joyce Banda Foundation, a charity that assists Malawian children and orphans through education - she has a degree in early childhood education. Joyce Banda cut her teeth in politics in 1999 when she won a parliamentary seat on the ticket of the former ruling United Democratic Front. She held a number of cabinet positions under former President Bakili Muluzi and Mr Mutharika during his first term. She puts her achievements down to her happy marriage to retired Chief Justice Richard Banda with whom she has two children. "My dear husband, Richard, has been the driving force behind my success and rise to whatever level I am now. My story and legacy is incomplete without his mention," she said. Mrs Banda's presidential challenges are huge: Aside from handling political divisions and possible opposition from Mr Mutharika's allies, she has to address Malawi's serious economic difficulties. It is one of the poorest countries in the world, with an estimated 75% of the population living on less than $1 (60p) a day. And former President Mutharika fell out with most of Western donors - on which the country depends for financial support. The cutting off of direct aid resulted in the country's worst shortages of foreign currency, fuel and essential drugs. But she has immediately made her mark - sacking Malawi's police chief Peter Mukhito, accused of mishandling anti-government riots last year in which at least 19 people were shot dead, and Patricia Kaliati as information minister. In the wake of Mr Mutharika's death, Ms Kaliati had held a press conference saying Mrs Banda had no right to take over as president - despite what the constitution said. The head of Malawi's state broadcaster has also been replaced.